I have worked at Anderson & Sheppard for the past ten months. I started working in the last week of September 2016. This coincidentally was the same week I should have returned to University. Before I started working for the company I had been studying tailoring at the London College of Fashion. Over my summer holidays I had been doing work experience at several houses on the Row. Through a series of fortuitous events I found myself being contacted by Anderson & Sheppard, they wanted to see if I would be interested in a vacancy that they had in their trouser department. After a week’s trail I was offered the position and so left my degree early to start my apprenticeship. Learning on the job is much more fulfilling and holistic than learning in the classroom and I have no regrets about my decision. Over the course of my short time at A&S I have been taught trimming, measuring, altering garments, striking and the most important part of a cutters job- drafting. The skills needed to convert a set of seven measurements (in the case of trousers) into a two dimensional paper pattern that then must be turned into three-dimensional garment is the hardest to develop and master. Thankfully there is a strong and capable team in the cutting room who can offer me guidance and support. This is what I am working on at the moment, any spare time I have is spent drafting practise patterns. I am sure that anyone who reads this blog is aware that at A&S we divide coats and trousers between two different departments. Each with its own dedicated cutters and tailors. As an apprentice to the trouser department I work beneath the head trouser cutter, Mr John Malone and trouser cutter Oliver Spencer. They have combined experience of almost 60 years at the company and so I know that I am in safe hands. My average day involves trimming jobs (matching pocketing, buttons, etc), couriering trimmed jobs to tailors, fetching customers garments when they come in for fittings, pressing garments and in general keeping on top of all the goings on. It is my job to know where every garment is, what stage it is at and when it will be ready. 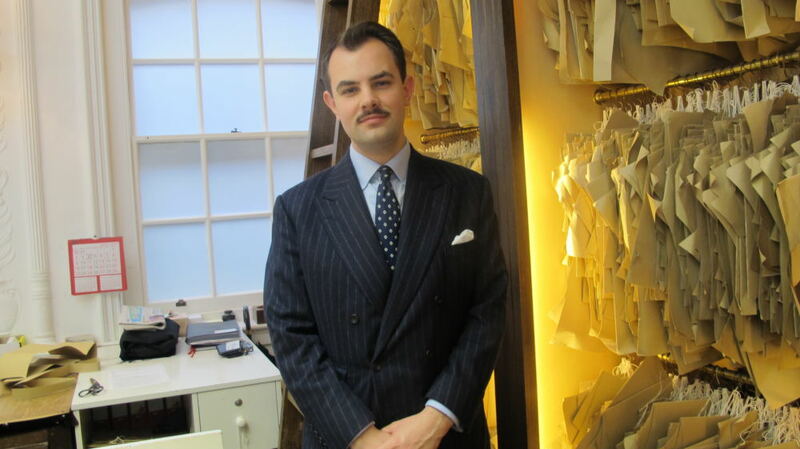 Working in the bespoke tailoring industry is great honour. Being a part of a trade that is centuries old and being entrusted with knowledge that has been passed down from generation to generation is fascinating, particularly for someone of my generation. In an age where it seems that everything we use is made overseas it is remarkable thing that there is still thriving industry in the heart of 21st century Mayfair. Things are being made by hand right in the centre of London, the trade is almost as old as the city and it is a pleasure and a privilege to call myself part of it.